The Midland Valley of Scotland, around Edinburgh and Glasgow, was an important coal-producing area. The coal is associated with richly fossiliferous Carboniferous rocks, and East Kirkton, near Edinburgh, has become one of the most famous sites (Milner et al., 1986; Clarkson et al., 1994). Fossils were first found there in the 1830s, and include abundant plants and rare eurypterids, i.e. large aquatic arthropods. The rocks consist of volcanic tuffs associated with limestones and unusual layered silica deposits, interpreted as the products of hot springs that were heated by nearby volcanoes. 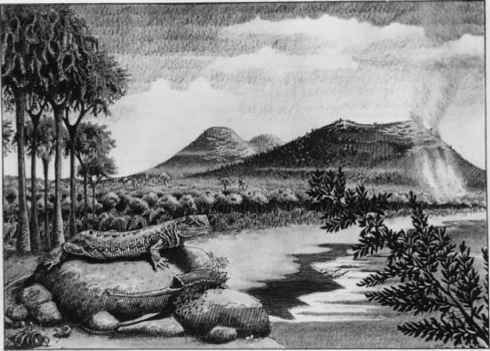 aistopod, and some anthracosaurs, Eldeceeon, Silvanerpetonand Westlothiana. Westlothianais close to the ancestry of am-niotes and, indeed, was hailed for a time as the world's oldest amniote. The East Kirkton locality is fascinating because of the unusual environmental conditions represented, but it also documents the earliest example of a probable terrestrial vertebrate community. 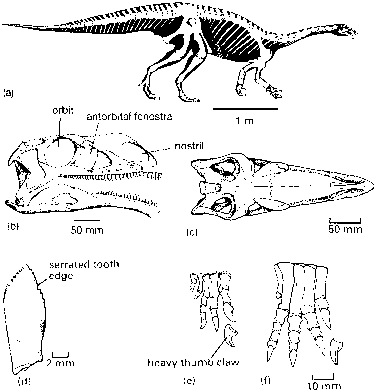 The extraordinary diversity of tetrapods contrasts with the very different Late Devonian tetrapod faunas.